If you are a fan of spelunking or cave exploring then the Fairy Cave of Kuching in Sarawak on the island of Borneo should feature as a ‘must-do’ attraction on your list. The Fairy Cave of Kuching is located at a distance of approximately 45 km from the center of Kuching and is accessible via a forty minute drive towards the town of Bau. Bau was an ancient gold mine town in the 1850’s and is located at a distance of 8km from the fairy cave. Once you have arrived in Bau, you can hire a taxi to transport you to the fairy cave known as ‘Gua Kapor’ in Malay. 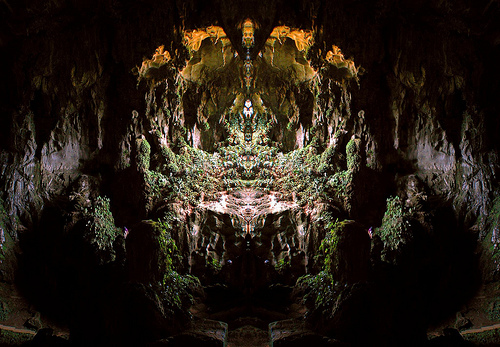 It is believed that this Fairy Cave of Kuching dates back more than 100-150 million years and serves as an important historical archeological site in Kuching. Before you embark your exploration of the cave, you should do some preparation like engaging the services of a local guide. This can be easily done in the town of Bau. You should also stock up on some basic necessities before you set out on your journey as the cave is located in a pretty remote area with nothing available for miles around. You may also want to make a toilet stop in Bau as there are no facilities near the cave. The Fairy Cave offers free public access and is open daily. You should set aside an hour or two for your explorations. The Fairy Cave is the largest cave entrance in the Kuching area though access to the cave chamber is quite exacting, for it requires navigation of concrete steps that rise to a height of about 100 feet. These steps and then followed by a set of wooden steps which lead to the main cave chamber. Entrance to the main chamber is actually via a small side passage where it is usually pitch-dark. This is where the torch you bring along will come in use. The mouth of the cave is adorned with much plant life and is often illuminated by strong sunlight that filters through the somewhat porous rock. The enormous cavern of the Fairy Cave has been carved out of the rock by the action of water down the ages. This gigantic hollow is also adorned with a fascinating collection of limestone formations, stalactites and stalagmites which take various forms. Some of these formations are over fifteen feet in height. One such formation resembles the Chinese Goddess of Mercy, Guan Yin and its location is a popular pilgrimage site. As you venture deeper into the cave, you will discover a small stream that flows through it, though you have to tread carefully as the floor of the cave is quite slippery due to presence of overgrown moss and bat droppings (guano). The Fairy cave of Kuching is less touristy that other cave systems in Malaysia and if you have a penchant for cave explorations, then the Fairy Cave of Kuching should definitely feature on your bucket list.